The poem captures Dickinson resigning herself to how ephemeral fame can be, how effortlessly it moves from one person to the next, pleasing, wounding, and deserting them as it travels across the earth. Dickinson’s comparison came to mind as I prepared a course at The College of New Jersey on the history of fame. On campuses across the country, one can find fascinating classes dedicated to the study of stars like Beyoncé, Madonna, and Bruce Springsteen. My course took a different approach. It focused not on individual personalities, but on the long line of thinkers who have grappled with the meaning of fame. 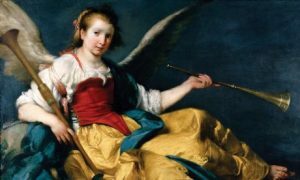 An Allegory of Fame, (circa 1630), by Bernardo Strozzi. Today’s college students are part of a fame culture that is far more absorbing than the one in which their parents grew up. Waves of publicity crash over them daily, with Twitter, Instagram, and BuzzFeed now added to the mix of dorm-room posters and fan magazines. But young people no longer see themselves as just spectators. Listen to the most savvy among them, and they’ll offer detailed strategies for “creating a personal brand” and “curating a digital identity.” As the phrase goes, they aim to optimize their presence in an attention-based economy. 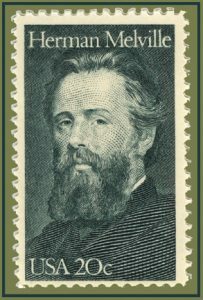 Melville’s novel captures the ways in which Americans could reinvent themselves as they pushed further west. 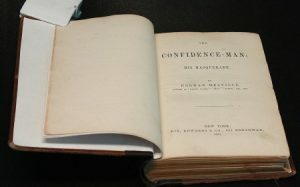 In the turbulence of the antebellum period, the Confidence Man urges his victims to look charitably on their fellow passengers and faithfully place their trust in him. When they resist, he accuses them of being faithless, of leading cynical lives, of disliking humanity and being misanthropes. What makes the Confidence Man so successful is that he swindles his victims not only of their money, but of the skepticism and critical thinking they need to successfully navigate their lives. The Confidence-Man is a difficult, problematic novel, one that unsettles its readers and gives them no footing in the text or the world. Nineteenth-century critics struggled to make sense of the book; “ineffably meaningless and trashy,” one reviewer called it, a “reckless perversion of high abilities,” wrote another. 160 years later, Melville’s probing and destabilizing novel may have found its time. As reports of fake news and paid internet trolls swirl around our digital frontier, as our leaders urge us not to question their actions and to place our trust in their hyperbolic vision of the world, The Confidence-Man is more urgent than ever, though the cause for that urgency would no doubt lead our great mariner to even deeper despair. 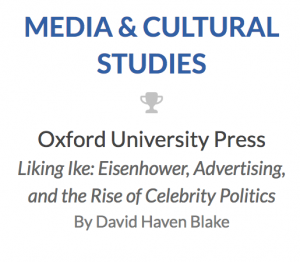 Thanks very much to the Association of American Publishers for giving its 2017 PROSE Award in Media & Cultural Studies to Liking Ike: Eisenhower, Advertising, and the Rise of Celebrity Politics. It is great to have Liking Ike included in such a distinguished group of books. Today marks the 60th anniversary of Ike Day, the star-studded celebration of President Eisenhower’s 66th birthday that was held in the midst of his re-election campaign. Over ten years ago, I heard about this forgotten moment in American political history and started the research that led to Liking Ike. 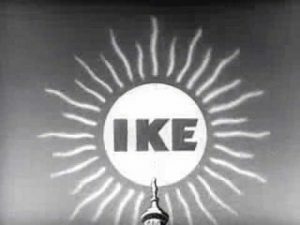 Produced by the McCann-Erickson advertising agency and funded by some of the nation’s wealthiest families (the Rockefellers, DuPonts and Olins among them), the Ike Day program barely acknowledged its role in the presidential race. There was no talk of policy, no reference to political parties and no mention of Eisenhower’s Democratic opponent, Adlai Stevenson. And yet, to many in the press, the telecast struck a note of political genius. “As a demonstration of how to win friends and influence voters,” the Philadelphia Inquirer commented, the program “was worth dozens of speeches.” The Washington Post concluded, “without a single plea for partisan votes, it was the most politically effective program of the week.” Continued at Time magazine. 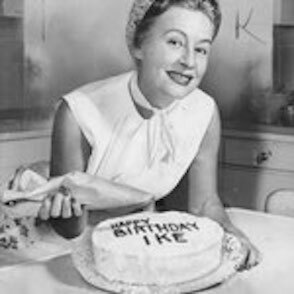 And finally, for those of you who love cooking as much as history, you might be interested in Mamie Eisenhower’s special recipe for Ike’s Favorite Cake. All over the country, volunteers baked cakes according to this recipe and brought them to Children’s hospitals, Veterans facilities, and nursing homes in honor of Ike. I have not baked one of these myself, but as Carl Anthony illustrates, Mamie was well known for her elaborate cakes. Posted in Uncategorized	| Comments Off on Happy Ike Day! Well . . . not exactly, but on the eve of its publication, Marshal Zeringue invited me to “dreamcast” a Liking Ike film for his terrific site Campaign for the American Reader. 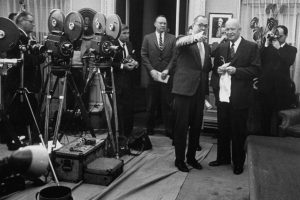 Liking Ike centers on the personalities who helped promote Dwight Eisenhower’s campaigns for the presidency and his own ambivalence about the new worlds of television, advertising, and celebrity. The story lies in the remarkable set of characters, which makes casting especially fun. The Eisenhower Memorial Commission has recently released its latest “Pivotal Moment,” part of the E-memorial that will be included in its four-acre urban park at the base of Capitol Hill. Titled “Winning the Presidency,” this seven-minute documentary is narrated by Tom Brokaw and features some excellent footage from the 1952 campaign. I was delighted to see this image from the “midnight rally” held at Madison Square Garden at the height of the Draft Eisenhower movement. With Ike in Paris serving as Supreme Commander of NATO, the organizers turned to Stars! Stars! Stars! for political excitement. Among the glamorous attendees were Clark Gable, Ethel Merman, Irving Berlin, Humphrey Bogart, and Lauren Bacall. You can see “Winning the Presidency” and learn all about the work of the Eisenhower Memorial Commission at their website. 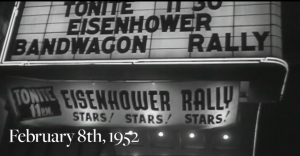 For more on the rally (and to learn how Bogie and Bacall eventually rescinded their support for Eisenhower and backed his opponent, Adlai Stevenson), check out Liking Ike. Posted in Uncategorized	| Comments Off on Stars! Stars! Stars! A reality star is now a major party presidential candidate, but it turns out, celebrity politics are not a new thing. 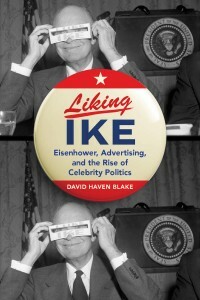 In Liking Ike, author David Haven Blake explores the crucial and often overlooked role that celebrities and advertising agencies had in Dwight Eisenhower’s presidency. Even by today’s standards, many Americans will be surprised to learn that celebrities of the time were a constant presence in political strategies, and particularly in Eisenhower’s campaigns. Using original interviews and archival material, Blake explains how Madison Avenue executives used celebrities as tools in politics as the age of Television began. 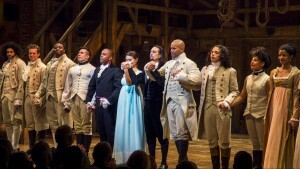 The astounding success of Hamilton, its capacity to engage audiences from third graders to the president and first lady, reminds us that Broadway musicals have a healthy tradition of mining political history. From 1776 to Evita, songwriters have been fascinated by political power. What drives people to become leaders? How do they rally supporters around them? What reservations do they have about their failures and successes? From costumes to choreography to the musical score, Broadway storytellers have amazing tools at their disposal, but as Lin-Manuel Miranda might agree, nothing attracts an audience like a tale of scrappy ambition carved out of the past. In July 2016, Oxford University Press will be publishing my book, Liking Ike: Eisenhower, Advertising, and the Rise of Celebrity Politics. Over the next months, I will be populating this site with blog posts, videos, and images related to the Eisenhower stars and what they tell us about American political culture today.